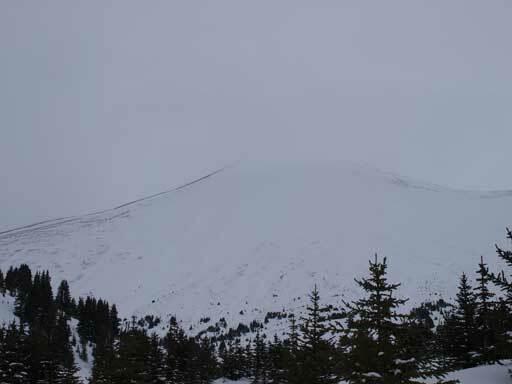 Opal Peak is an unofficially named summit near the north end of Maligne Lake in Jasper National Park. To reach its summit is merely easy scramble, and as a result it’s a fairly popular objective to local scramblers. Me, on the other hand, decided to attempt it in off-season conditions. 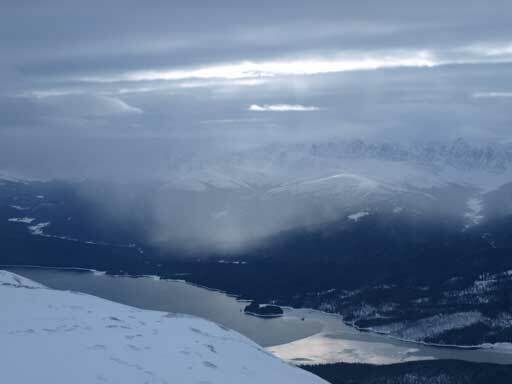 This was the 3rd day of November long weekend, and I woke up under cloudy sky in town of Jasper. It wasn’t as cold as the previous two nights, but I still quickly made my way to A&W for warmth. 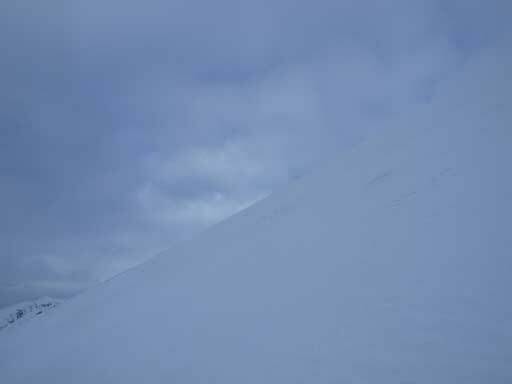 I was a bit worrying about the snow condition on Opal Peak. On top of that I had to solo that part as mom wasn’t used to steep open slopes. 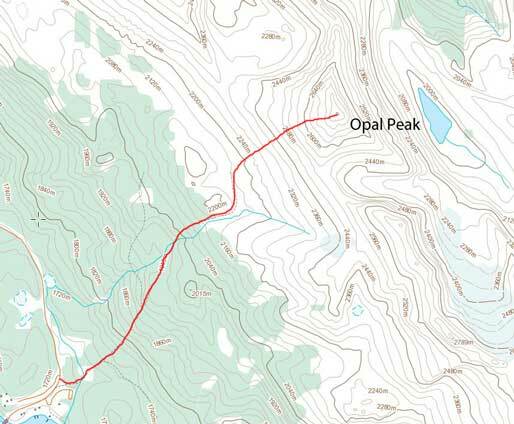 There’s an alternative plan on the south end of Skyline, namely Sunset Peak, so I would have an alternative objective if I didn’t like Opal’s upper slope. After breakfast, I drove towards Maligne Lake. The road was quite icy at places but was manageable. I could see scree on the upper slope of Opal so figured it’d be okay. This peak only involved 1100 m elevation gain, so we didn’t need to rush. But on the other hand, wherever there’s snow we had to pretty much post-hole to the bottom. Not far up we strapped snowshoes on, and from that point I did all of the trail-breaking. Near treeline, snow got much deeper. Even on my 30′ snowshoes I still sank to knees… It was very unsupportive. 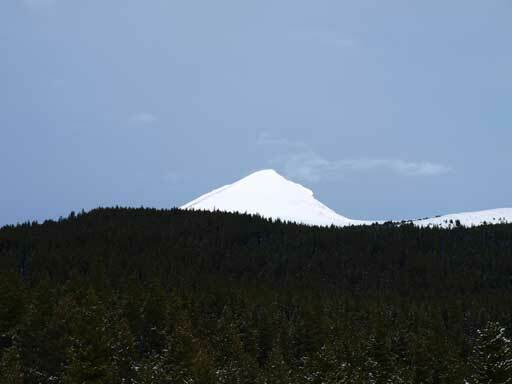 My objective, Opal Peak. My route goes up the face then the right skyline ridge. To get to the base of the peak I had to lose some elevation. According to the map, this area is called Opal Hills. Mom decided to wait for me at the treeline as she’s not confident on big slopes. The left hand side skyline ridge would be the safest in terms of avalanche condition, but I figured the snow wouldn’t be deep/dense enough to slide. I could just pick a straight line up the face and the step-kicking would be awesome. 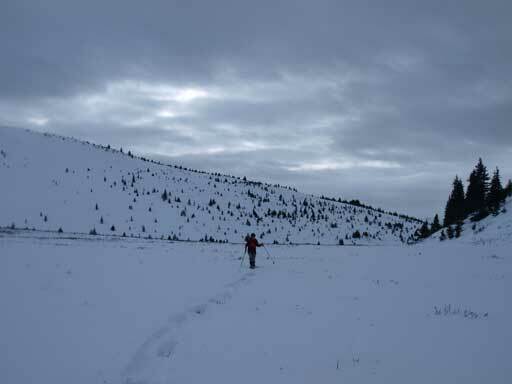 I ditched my snowshoes at treeline and changed to crampons. The scree was frozen solid and there was a layer of ice so crampons was necessary. The step-kicking up the face was great but slow due to the foreshortened view. I knew this was a 2800 m peak so at least I had to get up higher than the peaks on Skyline. Here is Opal Hills, and we had to lose some elevation over undulating terrain. Higher up, I entered the clouds…. Well, white-out on the summit. 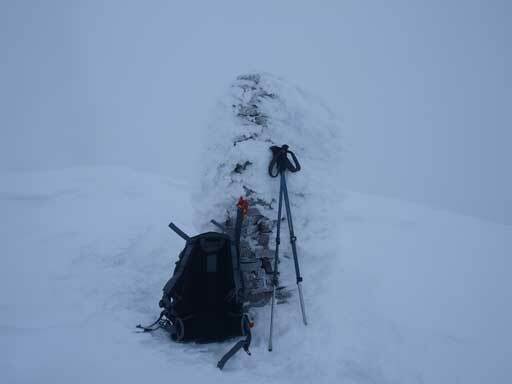 After a quick photo of the big cairn to prove I’d bagged this peak I immediately started the descent. It was very windy and cold. Plunging-step down the slope was way faster and in no time the view started to show up again. Lower down I got a decent panorama of this area. Maligne Lake wasn’t frozen yet. The only brief of the east side. Weather improved once we got down. Looking back at Opal Peak.